Sneakers is a cartoon cat and Bath Savings’ kids banking mascot. Sneakers loves giving fun gifts to his little friends. 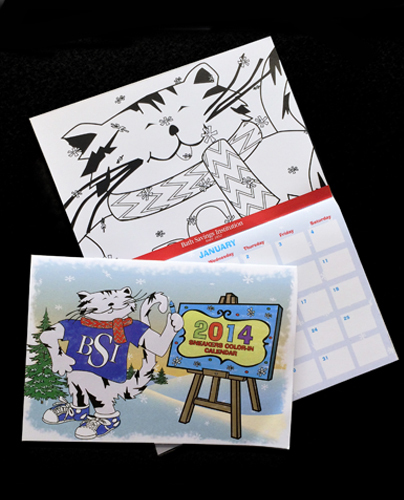 For 2014 he gave kids a Sneakers Color-In Calendar. Creative Director & VP Rebecca Morse designed a calendar with a black and white drawing of Sneakers for every month of the year. Snowy Sneakers, Surfing Sneakers, Halloween Sneakers. Kids have fun coloring him purrfectly. They can also check out Sneakers’ important days. Not just April Fools and Independence Day, but Winnie the Pooh’s birthday. Mickey and Minnie’s too. There you have it: proof that saving is fun at Bath Savings!